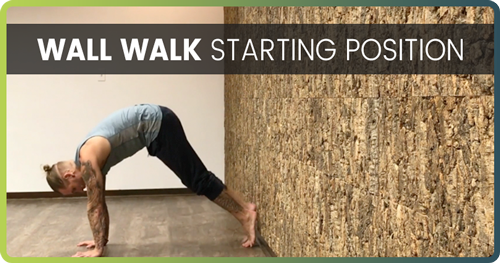 If you’ve ever wanted to learn how to do a Handstand properly, this Blog series is the place to be. The Handstand drills in these articles will lead you to the strongest Handstand practice you’ve ever had. With that said, let’s get started! 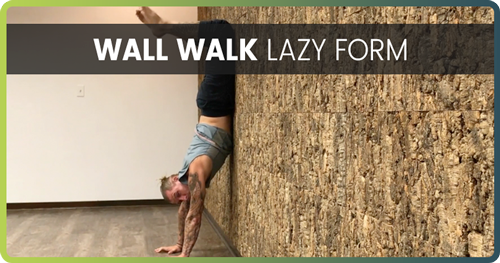 This installment is all about 3 Handstand drills that you can do right now using just a floor and a wall. Stay tuned for my next article about when to use the wall and when not to…it’s important. This particular drill is the perfect warm-up for learning how to shift weight from hand-to-hand in the safest environment possible. 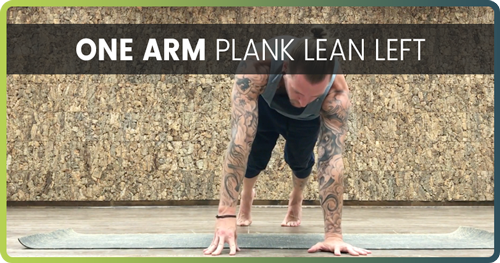 Much as its name indicates, this drill starts you in plank position and asks you to lean into one arm, shrug through that shoulder (aka protraction), and then lift to fingertips on the light hand. After a few reps, start to pull the hand all the way off the ground. It gets your brain/body familiar with the idea of shifting weight and really feeling the ground. You begin to learn to isolate individual arms. The isolation is HUGE when you start Handstanding and maybe find yourself leaning slightly left or right. 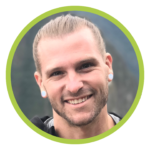 You want the ability to adjust each part of your body by itself and learn to move more specifically. 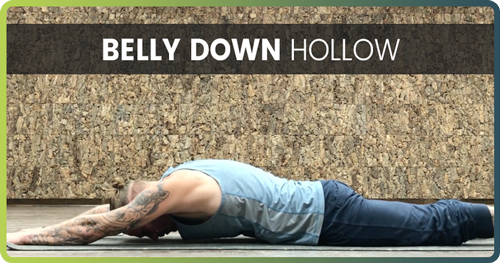 The idea itself is pretty simple: Make Hollow Body shape while on the ground with you belly facing downward….how hard could it be?? Fear not my friend! 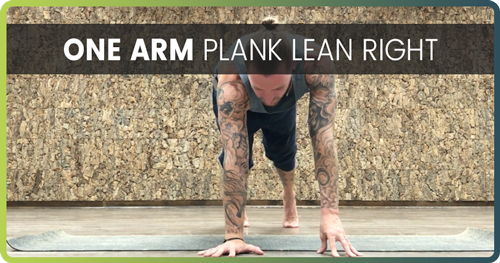 This one comes with layers to make it accessible to Handstanders of all levels. Layer 1: If it’s your first time doing this, really focus on pressing down through your hands and wrapping your armpits down and inward. This will help create lift in your chest and get it off the ground. Layer 2: Keep all of that engagement and now pull your belly off the ground as well. As usual, move from your middle and pull your belly button up and in. Layer 3: Aim your tailbone towards your hamstrings to create a slight tuck of your pelvis. At this point, you should be lifting your hips off the ground as well. I know, your entire torso is on fire. I get it. Of all the Handstand drills amongst Gymnastics, Circus, and Yoga, this is the one definitive drill that I can say has changed my Handstand shape the most. 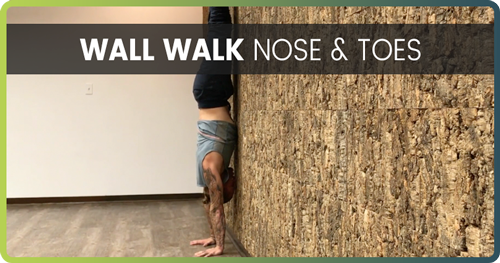 Imagine Handstand at the wall, but NOT kicking into it…So if you’re used to kicking up to the wall, this Nose & Toes drill might feel a little scary at first. In this particular Handstand exercise, you enter from the opposite angle and walk your chest inward. Once you have your hands under your shoulders for your Handstand shape, hollow out your chest and torso. 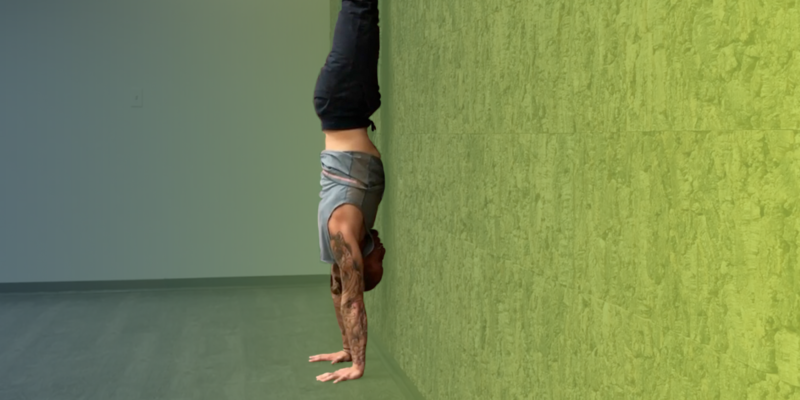 Eventually you’ll get your Handstand to the point where just your nose and just your toes are touching the wall. If you find your belly is on the wall, you’ve lost Hollow Body and that you may have a sway in your lower back. 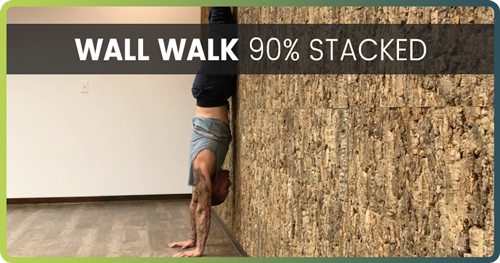 In conclusion, do these 3 Handstand drills together and in order to build towards a much more efficient use of the wall in your Handstand training.